French Marans Hatching eggs for sale. Our chickens are fed local grain and forage on fresh green pasture every day in season and home-grown sprouts in winter. Eggs are medication and hormone free. 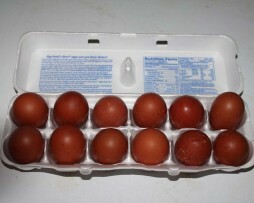 Eggs are large and dark brown and gathered fresh every day.